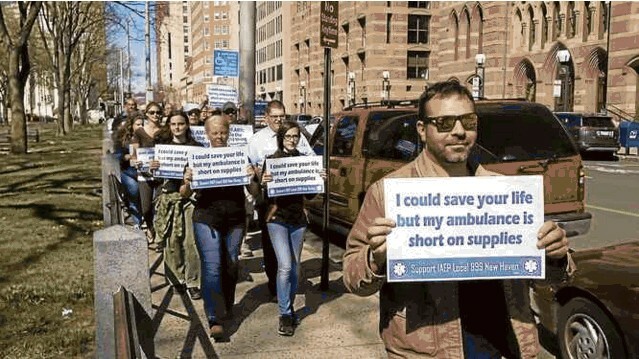 On Wednesday, May 18th, 2016 the ballots were counted in New Haven, Connecticut, where IAEP Local 999 voted in favor of a new contract. IAEP National Director Phil Petit and IAEP Negotiator Scott Schaub worked alongside Local President Michael Montanaro and IAEP members for months to complete the deal. Throughout this process members of Local 999 made significant efforts to voice their concerns and secure a fair contract, including outreach to the New Haven community and a rally held at the New Haven Green on Tuesday, April 19, 2016. The new contract guarantees substantial pay raises over the life of the agreement. The negotiation team was also able to secure favorable language that protects employee health benefits, short-term and long term-disability benefits, and the current health-care cost split between AMR and its employees. The IAEP wishes to thank its members for the solidarity and strength shown throughout this negotiation process, and to congratulate Local 999 on their new contract. NAGE National Executive Vice President Jim Farley and IAEP National Director Phil Petit rally alongside members of Local 999 in New Haven on Tuesday, April 19, 2016. 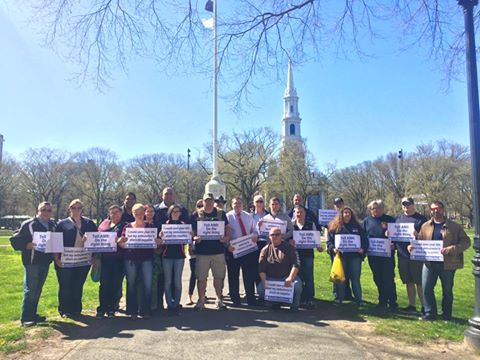 Members of Local 999 rally on the New Haven Green on Tuesday, April 19, 2016.